The holiday season has begun, at least on theater stages across the Twin Cities. 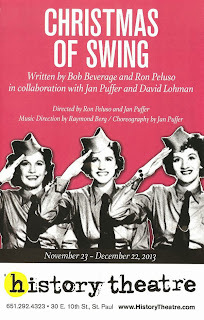 Since I was out of the country for the opening of the Guthrie's A Christmas Carol this year, my first taste of Christmas (other than the bitterly cold weather) is History Theatre's WWII-era musical review Christmas of Swing, featuring the Minnesota trio The Andrews Sisters. The return of this popular show is a fun and peppy showcase of 40s-era popular music (also featuring appearances by Bing Crosby and Danny Kaye), that incorporates real letters from WWII soldiers, paying homage to our veterans of this and other wars. 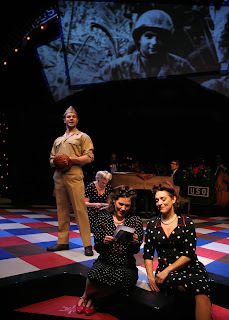 For the most part Christmas of Swing is a light-hearted show, with a few somber moments acknowledging the hardship of the soldiers. But The Andrews Sisters’ job was to entertain and uplift, not wallow in the sorrows of war, and that they do in abundance. The play, written by Bob Beverage and Artistic Director Ron Peluso, is set at a dress rehearsal for a 1944 Christmas Eve show at a VA Hospital for wounded soldiers. This allows us to see all of the great numbers, as well as witness the banter between the sisters and their band and manager between songs. It also has the light and easy feel of a dress rehearsal; the efforts of the cast do not seem labored, but loose and effortless. Ruthie Baker, Stacey Lindell, and Jen Burleigh-Bentz as the sisters Patty, Maxene, and LaVerne are just perfection in voice, movement, and personality, all of which blend together beautifully to create some tight harmonies and precise dance numbers. Ruthie gets most of the solos as lead singer Patty, but we also get a chance to hear the other ladies’ voices on their own, and all are lovely solo or in harmony. Bill Scharpen channels Bing Crosby in songs such as "Christmas in Kilarney" and "Here Comes Santa Claus," and Eric Heimsoth does a wonderful impression of the lanky and goofy Danny Kaye. Bill Scharpen also generates some laughs with Mark Rosenwinkel as the comedy duo Abbot and Costello. Bryan Porter and Eric Heimsoth (again) portray many different soldiers as the sisters read their letters, bringing the desperation, longing, and joys of these long ago men to life. The fairly simple set by Michael Hoover features some elaborate pieces that are wheeled out, including a sleigh and a huge two-sided cutout for an amusing number with the sisters and Danny Kaye. The choreography by Jan Puffer is a highlight – fast, sharp, concise, with that 40s swing action, effortlessly performed by the cast. The ever-busy Raymond Berg plays the piano while sitting in for the sisters' actual band leader Vic Schoen, leading the four-person band in a swingin' big band sound. I'm a sucker for period costumes, and these costumes (by Kelsey Glasener) do not disappoint! I love the sisters' black dresses with varying-sized polka dots and red trim and shoes, accented with long black coats with fur trim, red jackets, or authentic military green jackets. The men (who, for a change, have to change costumes much more frequently than the women) are dressed in authentic period uniforms and suits, as well as costumes for their various roles in the show. The sisters sing many Christmas songs, familiar and lesser known, and close the show with their most well-known song, the crowd-pleasing "Boogie Woogie Bugle Boy." 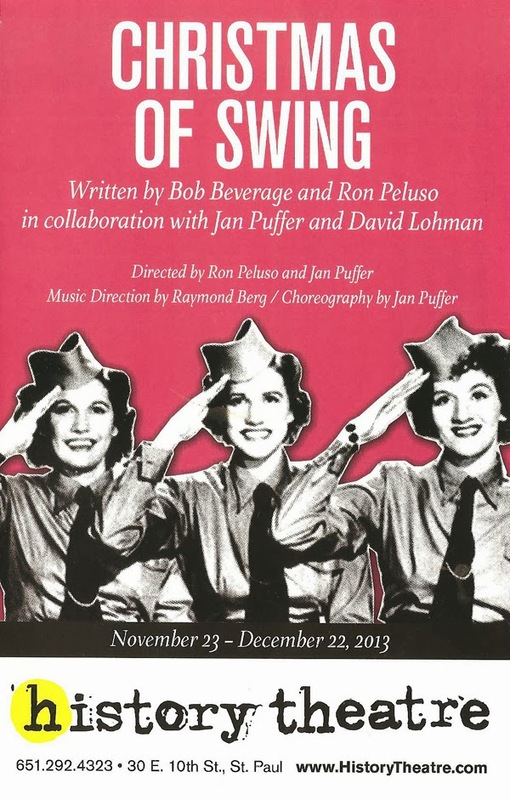 The History Theatre’s Christmas of Swing, playing now through December 22, is a great choice for a holiday show this year. Filled with the Christmas spirit (which I for one am not quite ready for, until Thanksgiving is over and/or we get our first big snowfall), humor, great songs and dancing, an energetic and entertaining cast, and respect for and celebration of vets, it’s a fun and feel-good show. What a wonderful, nostalgic show this seems to be. Those WWII performers register very highly in my memory bank -- as do others such as Vera Lynn and Gracie Fields, of course. I wish this show every success and also wish, desperately, that it would come Down Under to Sydney (but not the Lyric Theatre, please).